Carla Girtman was born in California, raised in West Virginia, and lives Florida with her husband, her adult daughter, and three cats (Majick, Tygur, and Nibbles who all claim they are the real writers of the family!). She is dabbling in copywriting which challenges her writing skills, but she would love to write full time for money. But alas, there are bills to pay and she works full time at an international airport. Writing fiction captured her attention in sixth grade, but sometimes she just plays too much Bejeweled than is good for her. However, Carla has joined the craziness of National Novel Writing Month since 2005, where she claimed success four times, and this spurs her to write longer fiction. Her favorite genre is speculative fiction, and flash fiction challenges have honed her writing skills. Her first published story, “Me? I’m No Writer” appeared in the community college magazine. Carla’s flash stories have also appeared in Clockwise Cat, Flashshot, Demonic Tome, Flashes in the Dark, Short Humor Site, Blink Ink,and Luna Station Quarterly, as well as in three anthologies: The Zombie Cookbook, Vicious Verses and Reanimated Rhymes, and The Drabbler. 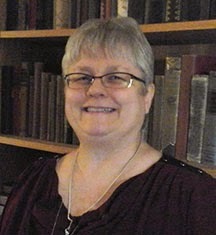 Carla is currently working on two books: Tarot at Midnight and Mermaids andZombies, and Vampires – O My!. In addition to flash fiction, her poems, “When God Awakens” appeared in The Corner Club Press and the poem “The Ring” found a home in Dark and Dreary Magazine. Oh, yes. There’s the church cookbook she is helping organize too. Due to come out in May! When she’s not writing, thinking about writing, reading at work or critiquing stories in her writing groups, she enjoys watching movies and collecting antique books (especially those relating to language). WOW: Congratulations on your first place win in our Fall 2014 Flash Fiction competition! What inspired you to enter the contest? Carla: Thank you! I was fully expecting to be just in the top 10! It’s weird about what inspired me to write for the WOW contest. I just had a good feeling about this particular contest and I had a perfect story in mind. Since it was open prompt, the contest allowed me to use one of my favorite published stories. But it wasn’t like I could just submit it! I had to cut nearly 400 words out. It took over two weeks to cut it down to size to meet WOW’s word requirements. And I was doing those edits while working on my 50,000 word story for National Novel Writing Month! WOW: Following your instincts paid off for you, well done! Can you tell us what encouraged the idea behind your story, Swamp Music? It seems like it might fit under the category of supernatural fiction. Carla: I belong to several writing groups. Swamp Music started out as a story prompt to “I need more time” in 2013 and was originally entitled The Price. Most of my stories do belong to the speculative fiction genre which can included supernatural fiction. I’ve always been drawn to “different” genres like fantasy, supernatural, slipstream, and science fiction. With the speculative fiction, often you can make your written world match what you want your world to be, not the other way around. This is not to say there are no rules when it comes to world building. The key is to make that world believable to the reader. That’s the real challenge! WOW: What do you enjoy about flash fiction writing versus the other kinds of writing that you do? Carla: I have written novels, screenplays, and poetry. But there is nothing like the challenge of writing flash fiction and being able to tell a short story that lets the reader decide who and where the story is. In Swamp Music, there is no description about what any of the characters look like nor is there an exact swamp location. Yet everyone who has commented on my story tells me they have vivid impressions on who the characters are and state they are transported to the swamp whether they think it is in Louisiana or Florida. Flash is all about story and letting the reader fill in the blanks. WOW: Yes, I did have a a strong sense of place and people while reading your story. You mention in your bio that you’ve participated in National Novel Writing Month for many years, completing the challenge several times. How have you learned to make NaNoWriMo work for you? Carla: The best thing about Nano I learned about Nano is you free your inner writer. There’s no room for the speller checker, the editor, or the critic to tell you how bad it is. There’s no time to really edit or even think about the story other than moving on to the next scene. Sometimes I can be writing furiously and suddenly, there’s a character there that just shows up with his/her own story to tell! Other times the story I thought I was going to write goes in an entirely different direction. There’s a certain amount of freedom when you aren’t chained to perfection and allow yourself to write badly. As a writer, you have to listen to the story to see where it wants to go. WOW: Good advice! Thanks so much for chatting with us today, Carla. Before you go, do you have any tips for our readers who may be thinking about entering writing contests? Carla: It’s been my pleasure to share some of my thoughts on writing with you and your readers! Some tips on entering writing contests? Write what you like writing. Do your best work. Enter the contest. Follow the rules. And don’t be afraid to lose. Good writing is still good writing whether or not you win. But you definitely can’t win if you don’t enter! For details and entry, visit our contest page!